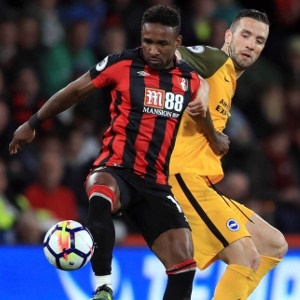 Bournemouth - Jermain Defoe scored the first goal of his second spell at Bournemouth to clinch a 2-1 win over Brighton in the Premier League on Friday, ending his team's four-match losing run to open the season. The 34-year-old England striker showcased his enduring prowess in front of goal by finding space in the penalty area from Jordon Ibe's deft pass and lashing a low finish into the corner in the 73rd minute. Ibe made as significant a contribution as Defoe on a wet evening on the south coast. The winger, coming off the bench, set up Bournemouth's 67th-minute equalizer - scored by midfielder Andrew Surman - with an impudent back-heel. Ibe has struggled to make an impact at Bournemouth since joining from Liverpool in July 2016 for £15 million, which was then a club-record fee. Bournemouth was on course to become only the fourth team to start a Premier League season with five straight losses when winger Solly March headed in the opening goal for Brighton in the 55th minute. Defoe spent the 2000/1 season on loan at Bournemouth from West Ham, scoring in 10 straight league games in one hot spell. He sealed a return to Bournemouth in the offseason, triggering a clause in his contract at Sunderland allowing him to leave on a free transfer following its relegation from the Premier League. "5,977 days since my last Bournemouth goal and it feels just as good," Defoe tweeted. This was a first ever top-flight meeting between the two seaside clubs, who were playing each other in the second tier only two years ago.